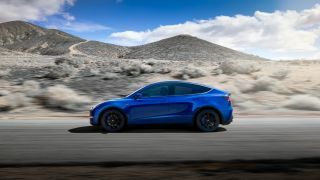 The forthcoming Tesla Model Y will have a tow bar, according to chief designer Franz von Holzhausen, making it a more practical choice for family vacations. The news comes via Norwegian site Elbien, which spoke with von Holzhausen at the Model Y's launch event in California last week. The designer also confirmed that the Model 3 will be getting a tow bar soon, but didn't elaborate before disappearing back into the crowd. Presumably that means the Model Y will come with a dedicated towing mode, like the Model X, which actively monitors trailer sway, and adjusts wheel braking and speed to compensate. The tow package for Tesla's larger SUV, the Model X, includes a 2-inch hitch receiver that's able to tow up to 5,000lb on 20-inch wheels, or 3,500lb on 22-inch wheels. Few electric vehicles have enough batter capacity to make towing feasible; in fact, the Model X was one of the first. We expect the smaller Model Y won't have quite the same pulling power (the AA noted a 17% drop in range when towing with a Model X), but it might surprise us.